Although the current Bridge of the Gods isn't as dramatic as the original land bridge, it still makes an attractive statement across the Columbia River Gorge. This bridge is an important link for hikers on the Pacific Crest Trail. It costs pedestrians 50 cents to cross this toll bridge with two traffic lanes, no sidewalks, and narrow shoulders. The toll booth remains open 24 hours a day for emergency vehicles needing access between Oregon and Washington State. Its the third oldest bridge across the river. In 1920, the US War Department gave the Interstate Construction Corporation a permit to build the bridge but progress was so slow that in 1926 they sold the permit to the Wauna Toll Bridge Company for $600,000. When completed, the balanced cantilever truss bridge had a main span of 708 ft with anchor arms of 212 ft. The total bridge length including approach spans was 1858 ft with a width of 35 ft. This bridge was 91 ft above the river and had a wooden deck. When the Bonneville Dam was completed in 1938, the bridge was raised 44 ft to prevent it from being inundated when the reservoir became full. This project was completed in 1940 for $760,000. 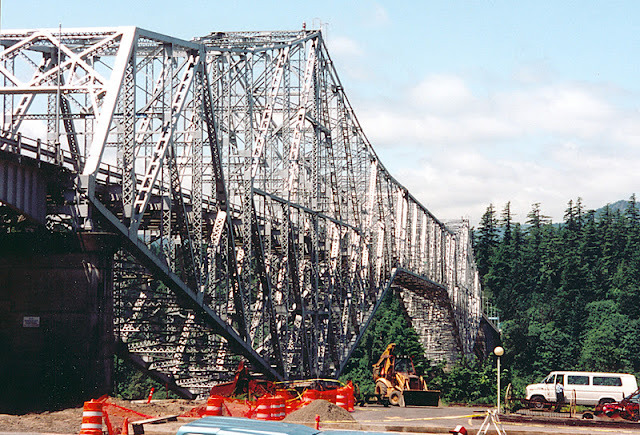 In the photo it looks like the truss was put on falsework, the concrete pier walls were raised 40 ft, and the superstructure was lifted onto the raised piers. The bridge changed ownership several times after the dam was built. Today, the bridge is owned and operated by the Port of Cascade Locks. In 1966, a second bond of $300,000 was used to rehabilitate the bridge. At some point the wooden deck was replaced perhaps by a steel deck covered with asphalt. Revenues from tolls pay for maintenance, painting, inspections, and bond repayment. The total cost of the bridge including construction, lifting, and rehabilitation was a few million dollars. It would probably cost $30 million to build this bridge today. There is an excellent website by the current owners that provides more information and photos of the bridge. Portland's Bridges: Bridge of the Gods (2) by Mark Yashinsky is licensed under a Creative Commons Attribution-NonCommercial-ShareAlike 3.0 United States License.